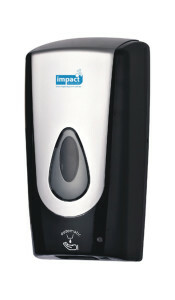 Impact Hygiene offers a range of smart soap dispensers to suit any establishment. Dispensers can be purchased at very competitive rates or can be included in a service contract. A subtly scented, gentle liquid soap that leaves skin feeling soft. Suitable for restrooms, bathrooms and hotel rooms. An odourless, antibacterial soap that leaves hands soft and free of bacteria. Suitable for commercial applications, kitchens, restaurants and other food preparation sites. Soap refills are available for purchase. Impact Hygiene supplies individually packaged soap bladders or liquid soap refills at service visits. Soap packaging and pricing varies depending on the dispenser range chosen.